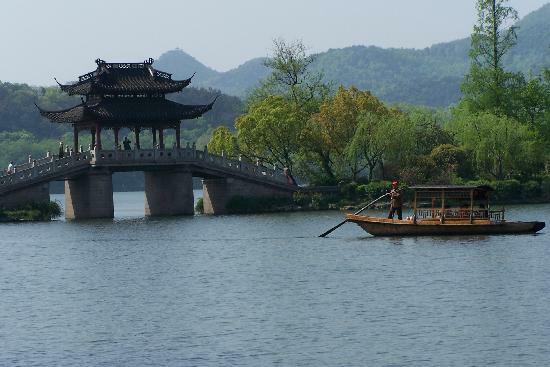 During my recent visit to China, I had a chance to visit Hangzhou city in the eastern China. 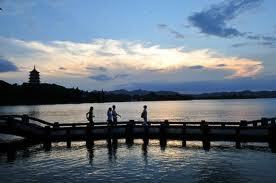 Hnagzhou is the capital of Zhejiang province and its the fourth largest metropolitan area in China. And what a visit it turned out to be. I would say, based on what I could pick up during my short visit that this great city is known for, among others, three things – (i) Lingyin Temple (ii) West Lake and (iii) a musical ballet on the Legend of the White Snake, also known as Madame White Snake, based on a Chinese legend, which has existed in traditions for more than 2000 years. It’s not surprising that all three are intricately linked. 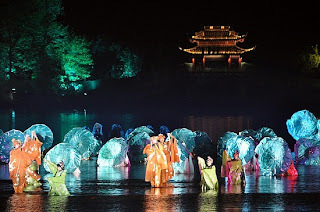 I am aware that this write up may be a bit longer but I can't resist mentioning albeit briefly about Lingyin temple and West Lake before describing the ballet in detail. Lingyin Temple - Lingyin Temple a Buddhist temple literally translates as Temple of the Soul's Retreat. It is one of the largest and wealthiest Buddhist temples in China, and contains numerous pagodas and Budddhist grottoes. The monastery is the largest of several temples in the Wulin Mountains the most famous of which is the Feilai Feng (literally "the peak that flew hither"). The monastery was founded in 328 AD and at its peak under the Kingdom of Wuyue (907-978), the temple boasted nine multi-storey buildings, 18 pavilions, 72 halls, more than 1300 dormitory rooms, inhabited by more than 3000 monks. Many of the rich Buddhist carvings in the Feilai Feng grottos and surrounding mountains also date from this era. The temple has been destroyed and rebuilt 16 times. Feilai Feng, or "the Peak that Flew Hither", also commonly translated as "Flying Peak", is located in front of the temple proper. The peak is so-named because it is made of limestone, giving it a craggy appearance very different from the surrounding mountains. Legend holds that the peak was originally from India but flew to Hangzhou overnight as a demonstration of the omnipotence of Buddhist law. A large number of carvings dot the surface of the peak. More are located in various caves and grottoes throughout the peak. Within the main cave, dedicated to the bodhisattva Guanyin, there is a crack in the ceiling of the cave that stretches up to the surface, so that a person standing at a certain position can see a sliver of sunlight. This is known as the "one thread of heaven". Feilai Feng also boasts of Meitreya Buddha -the original “laughing Buddha”. It is said that "his belly is big enough to contain all intolerable things in the world and his mouth is ever ready to laugh at all snobbish people on the earth". 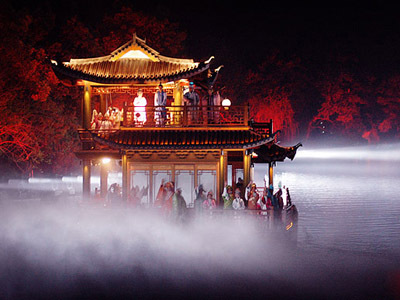 West Lake - West Lake or Xī Hú is a freshwater lake and is one of the most famous landmarks of Hangzhou. 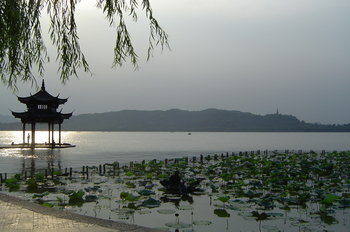 There are numerous temples, pagodas, gardens, and artificial islands within the lake. West Lake has influenced poets and painters throughout the ages for its natural beauty and historical relics, and it has been among the most important sources of inspiration for Chinese garden designers, as evidenced by the impact it had on various Chinese classical gardens. It was made a UNESCO World Heritage Site in 2011, and was described as having "influenced garden design in the rest of China as well as Japan and Korea over the centuries" and as reflecting "an idealized fusion between humans and nature." A boy called Xu Xian, buys tangyuan (immortal pills) from Lü Dongbin, one of the Eight Immortals, who disguised himself as a man selling at the Broken Bridge near the West Lake in Hangzhou. He does not feel hungry for the next three days after eating the tangyuan and is so puzzled that he goes back to ask the seller. 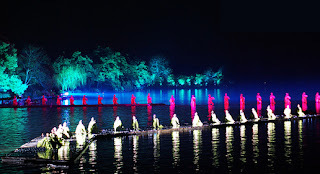 Lü Dongbin laughs and carries Xu Xian to the bridge and flips him upside down, causing Xu to vomit out the pills into the lake. 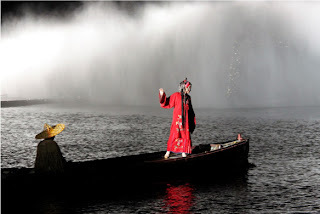 There is a white snake spirit in the lake, who was practicing Taoist magical arts in the hope of becoming an immortal after centuries of training and cultivation. The white snake eats the pills vomited out by Xu Xian and she gains 500 years of magic powers. The white snake is grateful to Xu Xian and their fates became intertwined. There is another terrapin (or tortoise) spirit also training inside the lake and he did not manage to consume any of the pills, so he becomes very jealous of the white snake. One day, the white snake sees a beggar on the bridge, who has caught a green snake and wants to dig out the snake's gall and sell it. The white snake transforms into a woman and buys the green snake from the beggar, saving the green snake's life. The green snake is grateful to the white snake and she regards the white snake as an older sister. Some 18 years later, the white and green snakes transform themselves into two young women, called Bai Suzhen and Xiaoqing respectively. 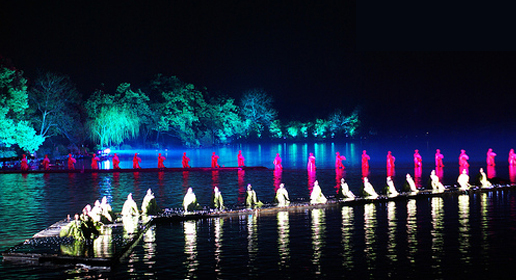 They travel to Hangzhou and meet Xu Xian at the Broken Bridge, and Xu lends them his umbrella because it is raining. Xu Xian and Bai Suzhen gradually fall in love with each other and are eventually married. 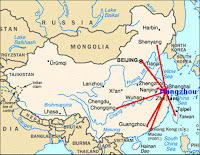 They move to Zhenjiang and open a medicine shop there. In the meantime, the terrapin spirit has accumulated enough powers to take human form, and he transforms into a monk called Fahai . He is still angry with Bai Suzhen and he plots to break up her relationship with Xu Xian. He approaches Xu Xian and tells Xu to let his wife drink realgar wine. Bai Suzhen unsuspectingly reveals her true form as a large white snake after drinking the wine and Xu Xian dies of shock after seeing that his wife is not human. Bai Suzhen and Xiaoqing travel to Mount Emei, where they brave danger to steal a magical herb that restores Xu Xian to life. After coming back to life, Xu Xian still maintains his love for Bai Suzhen despite knowing her true identity. Fahai tries to separate them again so he captures Xu Xian and imprisons him in Jinshan Temple. Bai Suzhen and Xiaoqing fight with Fahai to rescue Xu Xian, and Bai uses her powers to flood the temple, drowning many innocent people in the process as well. However, Bai Suzhen's powers are limited because she is already pregnant with Xu Xian's child so she fails to save her husband. 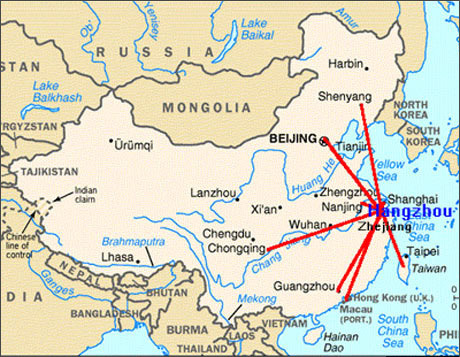 Xu Xian later manages to escape from Jinshan Temple and he reunites with his wife in Hangzhou, where Bai Suzhen gives birth to their son, Xu Mengjiao). Fahai soon tracks them down and he defeats Bai Suzhen and imprisons her in Leifeng Pagoda. 20 years later, Xu Mengjiao tops the imperial examination and returns home in glory to visit his parents. At the same time, Xiaoqing, who escaped when Bai Suzhen was captured by Fahai, goes to Jinshan Temple to confront Fahai and succeeds in defeating him. Bai Suzhen is freed from Leifeng Pagoda and reunites with her husband and son, while Fahai flees. It's simply amazing what a master piece of art can elevate you to newer heights of soothing nirvana which was what this ballet is. 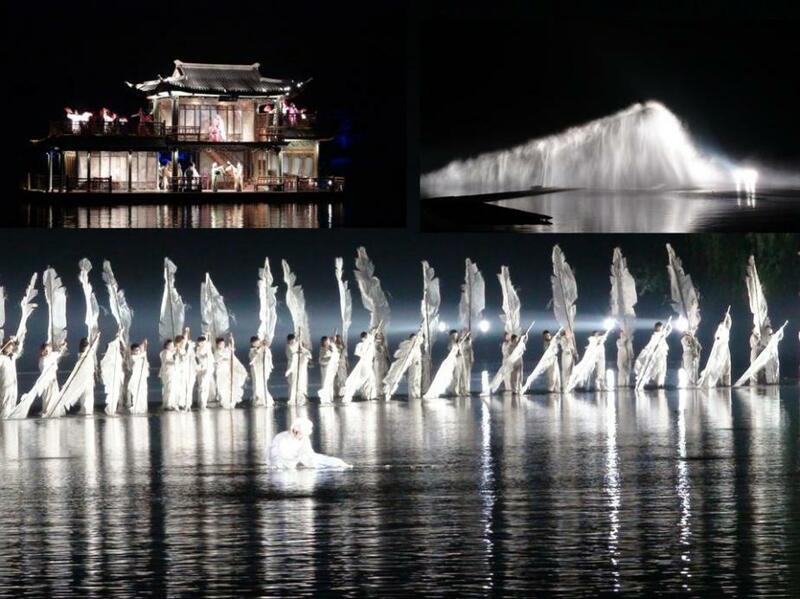 I kept wondering throughout the ballet as to how have they managed a stage on water surface in a lake. 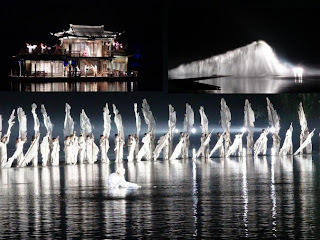 The lighting affect and the visual impact when combined with the haunting music and dance synchronization makes this ballet as the best I have seen this date and I would say that one should visit Hangzhou just for the sake of watching this Ballet. Portion of this ballet can be watched in the youtube.